I often wonder how Jesus would have used an iPhone. I’m pretty sure He wouldn’t take calls during meals or check his email during worship. I think he’d post parables on social media and text encouragements to his disciples. I wholeheartedly believe this—but of course I’m just guessing. We have to extrapolate when it comes to what the Bible says about tech. Proverbs 18:9 warns us against being slack in our work. Often, when we scroll through our social media feeds, we’re mindlessly procrastinating. Proverbs 18:13 warns us about interrupting. When we hop around from task to task, we’re not letting our own thoughts fully form. And when we constantly check our phones, we’re interrupting ourselves! I doubt the concept of time management was new in Jesus’ era, or even in Noah’s (he had to get that ark done before the rain came, after all.) 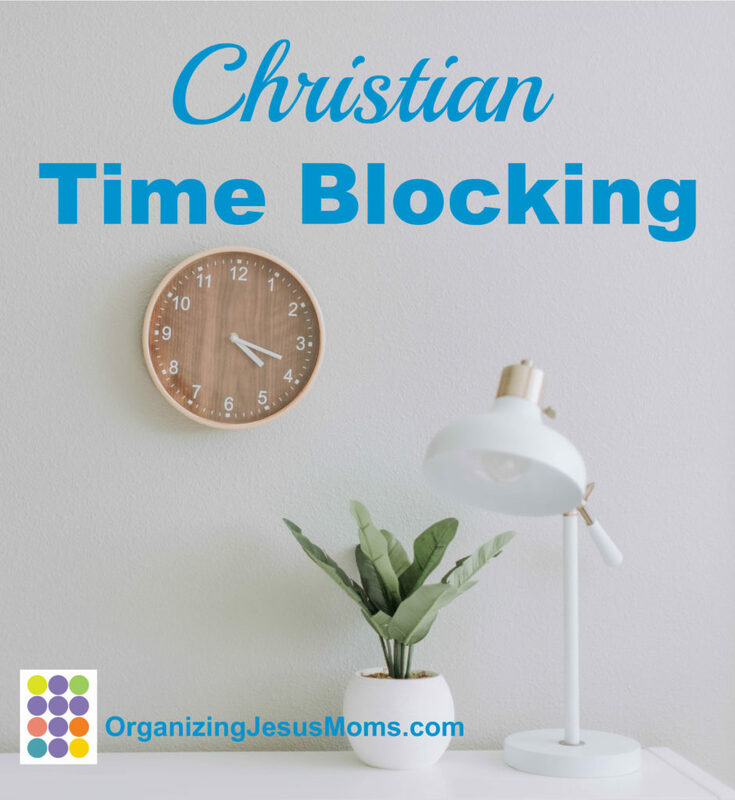 I do think time blocking is an idea rooted in Christian values like hard work and determined focus. The only caveat I have is this: when time blocking, make sure you’re not blocking the people God has placed into your sphere of influence. Feel free to plan time blocks! Ignore non-urgent texts and emails. Eschew social media and let go of worries about other projects. But as I said in Organizing You, learn to love your interruptions—because very often, they’re people who need you. If you get a “I need to talk” text, release your time block. If someone knocks on your door and says, “I really need some help,” invite them in. And if you’re feeling unfocused or unsettled about how you’ve blocked your time—like maybe you should be working on a different project, or spending time with someone who’s on your heart—stop and pray. That may be the Holy Spirit interrupting you! Time management systems are only effective when we’re dedicating our time to the Creator of it! Try tackling a project with time blocking. Note how many times you feel the urge to check your phone, computer, and social media. Consider how you handled the interruptions to your time block. Do you have any thoughts or feelings about the experiment you’d like to pray over?